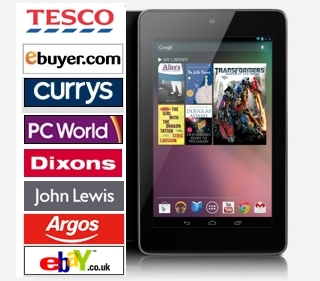 The past few weeks has seen a regular pattern of Nexus 7 stock availability at UK online retailers. One the most popular stores, Tesco Direct, has generally had really good stock levels since the Nexus 7 launch however more recently has regularly run out of online stock during the day which is then very often replenished early the next morning. The DSGi group of electrical retailers (i.e. Currys, PC World and Dixons) since the 9th August have had intermittent stock whereas eBuyer.com has consistently had stock since the 2nd August. We have heard that eBuyer have sourced and imported additional stock from the Far East which accounts for their healthy stock levels. Meanwhile John Lewis has somewhat been left behind with no stock online whatsoever. John Lewis is unique in that it offers a free additional 1 year guarantee with the Nexus 7 on top of the statutory 1 year, giving 2 years in total which proves very popular with its loyal band of customers. We are constantly tracking for this stock and registered users will receive immediate emails when stock is found. Argos had two periods where they were taking online orders for delivery during August, however they have now stopped taking any orders and have no stock available at their local stores either. Ebay prices are still higher than retail prices which is another indication of high demand as some people are obviously happy to pay these prices as opposed to shopping around and waiting for retailer stock. We think demand for the Nexus 7 tablet and is likely to increase in the coming months with the Christmas shopping period fast approaching. We will have to wait see if Google/ASUS can keep up with the demand with no word as to whether manufacturing levels have been increased to cope.